Dancing in the Rain: Why Am I Still Blogging? 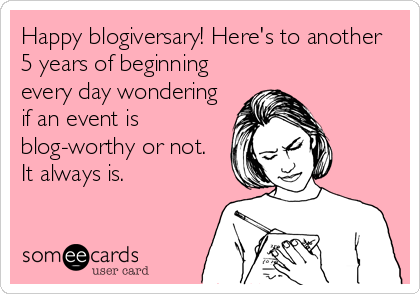 Five years ago today I set up a Blogger account, created a blog I cleverly titled "Just Jennifer" and wrote my very first post. I had no idea what I was doing. I had no clue about blogging, the "blogoshere", the hops, link-ups, memes, community or Twitter. I remained clueless for the entire first year. I didn't even think anyone besides my mom and my bestie would ever read it. I thought blogging was merely an online form of journaling. Over the course of the next four years, however, my little bloggy mind expanded and things evolved into what you see now. It's been very organic and Zen, for the most part. I mean, I'm not dumb, I have learned a little about SEO and social media engagement, thinking up clever post titles and how to create pinnable images in order to maybe have my writing read by a few other people than my mom and bestie. There's the rub. I realized I wanted to be read by others. Potentially by lots of others. In getting to know other bloggers, their niches and whathaveyous, I discovered that I have a unique, and maybe even interesting, perspective on life. I also learned that people -- every last one of us -- are in need of input, insight and validation from others as we explore the murky depths of ourselves, and try to navigate our lives. Through blogging I have also learned that I love to share and connect, and even to influence. I've learned that this is my THING. I was not a kid who had a strong idea what I wanted to be when I grew up. I thought about teacher, nurse, lawyer and even astronaut. Besides fantasizing about getting to have the big desk and impose mass amounts of homework on my pupils, one thing I knew for sure I would want in my adult life was a family of my own. But that was all I knew. I did start college, but then I became legally blind. I met my husband, we both went back to school, his kidneys failed and I decided to get vocational training instead of continue with college (I cannot remember the reason I chose to do that). Mark got a transplant, took more classes and started working, as did I. We got married and had a baby. Then we relocated from California to Washington state. 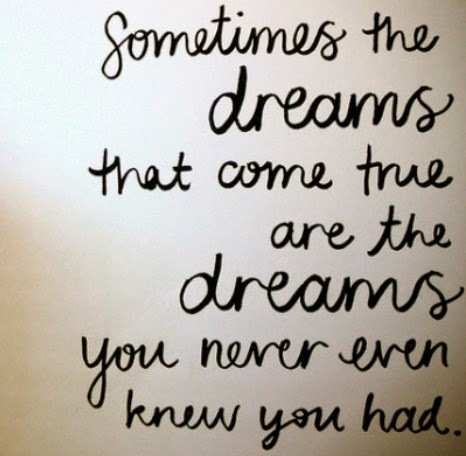 I knew I probably wasn't going to be working anymore once we left California; being a mom was the only dream I had. I only ever saw a job as a means to support one's LIFE. Moving to a place with a lower cost of living was going to allow me to be a SAHM. Of course the itch to have another child came, and we did. Having small children is thoroughly time-consuming, but when my son started preschool in early 2010, I suddenly had a little more time on my hands. By April, I started a blog. Looking back on what my academic strengths were, I should have known there was a bit of a writer in me. I always excelled in English classes, always got good grades on essays (even if I procrastinated and had to hammer them out at the last minute). Words -- vocabulary, spelling, putting words together sentence doing -- came easy. My daughter recently had a persuasive essay assignment to do in her English class. I was quite literally giddy to help her with it, to the point that I had to force myself to not just do it for her. I may never write a book (certainly not a novel!). I may never write something that goes viral or become Internet famous. I don't care. None of that is the point. Even though the past seven months have been more difficult for me due to my husband's health problems, I am still blogging because it is a big part of my identity now. I need this space. It is all mine and I take it seriously. It is not just a hobby. I may not have amassed a huge following in my five years plucking away at my keyboard, but I do feel I have things to say that others might benefit from. I do believe I have a special perspective.